Another illusion from Shigeo Fukuda, in this one he's welded together 848 knives, forks and spoons to produce an object the shadow cast from which forms the perfect shape of a motorcycle on the ground. no, this is seriously real. It's in art textbooks and everything. Look up the artist, he has other works too. Ingenious!!!! So cool.If it were fake...Same comment!!! This is a genuine artwork. 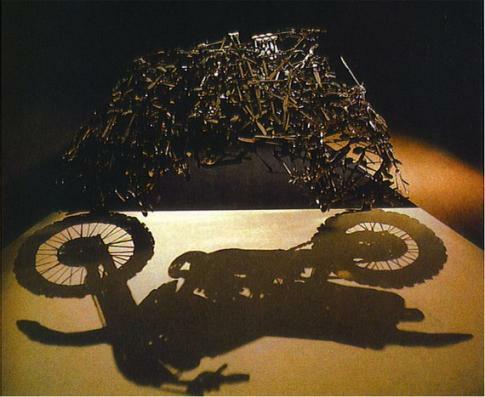 This is an inspirational art called Shadow Sculpture. The ultimate goal is to create an art that is cannot be defined by its appearance but tells a whole lot meaning when the shadow being projected. It's genius. The artist's name is Shigeo Fukuda. Theres a reason why everyones calling it fake, because he has clearly blown everyones' mind away. That, ladies and gentlemen, is called greatness. This is beyond art, this is simply amazing. well, duh. nothing is impossible in this world for those who are saying this is fake are just a bunch of lazy know it all who are too lazy to move their arses and type shigeo fukuda in the search engine. he's a known artist, i tell you. the world is wider than you think. so move those arses of yours and explore this world, you lazy butts. may i know what is the meaning of this art? Those of you who think this is photoshopped really suffer from a lack of imagination and appreciation of creative peoples inventiveness. While not easy in execution and requiring real cleverness to conceive, the method seems clear; draw motorcycle outline on floor, set up strong light source and then methodically add the cutlery, one piece at a time so that the shadows cover the correct part of the floor. Also, I would Google the artist to see some of the other clever installations by him. BTW-All are regularly exhibited in museums-real hard to fake. What a job !. Unbelievable !.